There have been several claims in the media that white men are more likely to commit mass murders. I've seen rather strong evidence that the vast majority of these crimes are committed by men, so I don't doubt this part of the claim. On the other hand, I haven't seen any non-dubious statistics for the racial aspect of the claim. Are white people more likely to commit mass murder than those of other races? We identified a total of 28 mass murderers who fit the criteria for inclusion [male mass murderers in the U.S. since 1970]. [...] 71.4% were White, 14.3% were African American, and another 14.3% were some other race (Asian, Arab, and Native American). This only shows that given a mass murderer, they are more likely to be white. From the chart and references here, white people made up 87.5% of the U.S. population in 1970, 83.1% in 1980, 80.3% in 1990, 75.1% in 2000, and 72.4% of in 2010. 71.4% of mass murderers being white is not an over-representation of whites. 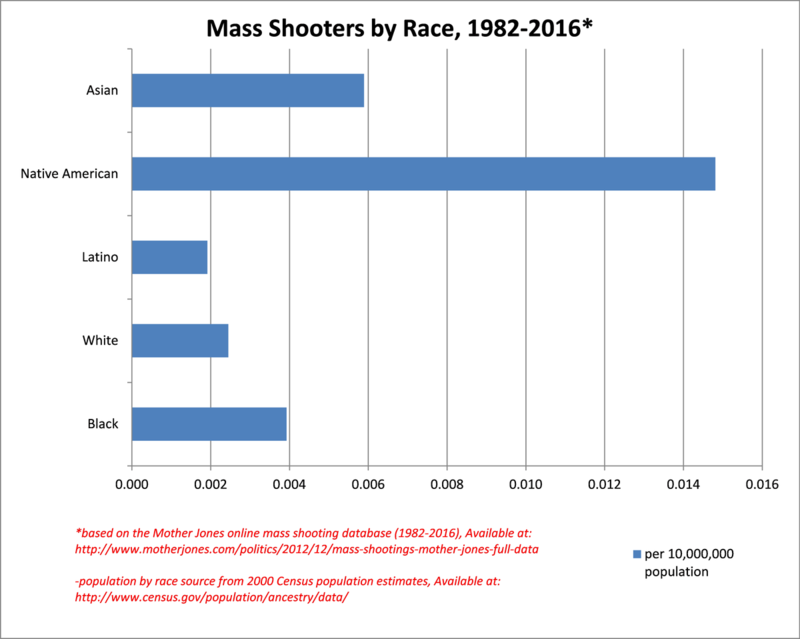 according to a database compiled by Mother Jones, the race of the shooters is proportionate to the overall US population, although Asians are overrepresented and Latinos underrepresented. This includes way more mass shootings than the other answer. "If you look at the whole list, it turns out that whites and blacks are pretty proportionate to their population, very close," said Dave Cullen, author of the book "Columbine," which tells the story of the 1999 massacre at Columbine High School in Littleton, Colorado. Harris and Klebold, the shooters there, were white. Historically, Latinos and Asians have been the exception. The Virginia Tech massacre was carried out by Seung-Hui Cho, who was born in South Korea. "Latinos are almost nowhere to be seen," Cullen told CNN's "New Day." "Asians continue to be heavily overrepresented -- more than 2½ times their size in the population." It would depend on what you mean by 'more likely'. People with light skin tone are a larger share of the population, and so they will also be a larger share of the perpetrators, but not a larger share as a proportion of their population. I've come to discover that the Mother Jones compilation may be biased, as it left off Plano, TX, 8 killed. It also has shootings with only 3 fatalities, while mass shootings are generally defined as 4 fatalities (not including shooter). Why didn't they include the Ohio baby party 'mass shooting' with many injured but only 1 fatality? Why do children commit mass murder in their schools?